An online learning program for CSLA members and friends. Google asks you for an email address - this becomes your username. 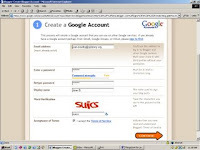 ->You do not need a Gmail account. ->Remember to write down your Username and Password. Remember that the whole web world can see your blog title and blog address. You probably don’t want to use your real name. Consider creating a blog name that’s anonymous, yet uniquely you. The URL for your blog will look like these examples - http://2CoolTools.blogspot.com/ or http://preilly.wordpress.com/ . (These are real blogs so of course you need to give your own blog its own unique name.) The format is name.blogspot.com when you use blogger.com software. Note: There are no www in the address when using Blogger.com software. Please remember your URL address and/or bookmark it. Blogger has several templates - have fun choosing one for you! If you run into problems, check out Blogger's Help file and Tutorial or ask your CSLA 2.0 Team. You will be able to change the color and look of your blog anytime -- so keep it simple at first. 1. Set up a blog for yourself through Blogger. 2. Play around and add a test post or two. Please clearly label each entry in your blog in the following way: Week 1, Exercise or Thing #1, subject. Each of your posts should provide insights into what you’ve discovered and learned. Feel free to share what worked for you … and what didn’t … what surprised you … what frustrated you … what amazed you. For example: Your ‘Thing 2’ post will talk about which habit among the 7 and 1/2 lifelong learning habits is easiest and which is hardest for you & why. TIP: This is a good time to "bookmark" your blog or make it a "favorite" for easy access throughout the course. 4. Create an avatar -- a representation of yourself. Go to http://avatars.yahoo.com/ , design an avatar with a library or classroom background. (You will have to set up an account if you don't use Yahoo!) Save your avatar and export to your blog. These exercises are all about discovery! Have fun … and happy blogging!! *Bonus - Create an account on Twitter. A word about micro-blogging or Twitter. Twitter allows each person to type 140 characters at one time, so it is usually short thoughts, ideas and topics. Twitter allows anyone to join and follow short ideas, thoughts, pieces of information of others. Some describe Twitter as their newspaper, a bulletin board, a club. Here is one description of Twitter. Just like many online tools, until you start using it, you're not sure how it can be used. If you do join, please do follow me (liz_dodds) and then I can follow you. The Library Store: Illustrators Galore! Learning 2.0 is a discovery learning program created by Helene Blowers. Content and style for School Library Learning 2.0 has been borrowed and duplicated with permission under a Creative Commons License.